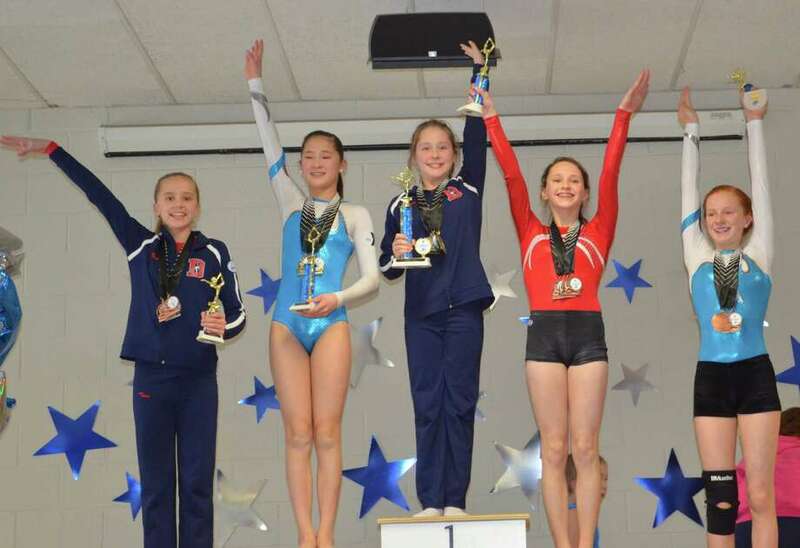 Darien YMCA Level 6 gymnast Lana Schmidt was the All Around champion at the 2015 Connecticut State Championships while teammate Tess Keating placed fourth. The Darien YMCA gymnastics team reached new heights at the 2015 Connecticut YMCA State Championship meet in Glastonbury. Level 5 gymnast Leah Wall scored a perfect 10 for her floor exercise routine, winning the All-Around (AA) title and leading the team to a first place finish. Six additional gymnasts were AA champs for their age group and level including Gabriela Pye, Holly McGoldrick, Lana Schmidt, Juliana Jordao, Fiona Brock and Jessica Freiheit. In the Level 3 eight years group, Lauren Smith won the vault and floor titles and placed third on bars, beam and AA. Alannah Morris placed fifth on vault and seventh on floor in the 9s group. In the 10 Juniors, Brook Romano was the beam champ with 9.6, placed fourth on vault, seventh on bars, third on floor and second AA. Grace Nash was second on vault and bars, seventh on beam, fourth on floor and third AA. Amelia Lancaster was fifth on vault, third on bars and ninth on beam and AA. Kira McCreesh was sixth on vault and ninth on floor. Olivia Perkins led Darien in the 10 Seniors, winning the vault and bars titles and placing fifth on beam, sixth on floor and third AA. Alexandra Decsi was seventh on bars and tenth on vault. Amelia Kuhn earned her meet high scores on vault and bars. The third place Level 4 team was led by Devan Grills in the 8-9 group, where she took first on bars, third on beam and floor and second on vault and AA. Melina Cardini placed second on floor and third on bars and AA. Iris West was the vault champ and earned fourth on bars. Anna Primmer's meet high score was for floor. Gabriela Pye won the AA with 37.20 in the 10 Juniors group, while also swinging to the bars title, placing second on vault, tying her twin sister Caterina for second on floor and earning third on beam. Caterina also captured a title of her own on beam, placed sixth on vault, third AA and tied Isabella DeStefano for second on bars. DeStefano took first on floor with a 9.9, placed second on beam and AA, and tied with Nima Rahbar for fifth on vault. Rahbar also placed sixth on bars and third on floor. Jane Tortorella was third on vault, fifth on bars and sixth AA. Audrey Ridder was fifth on beam and fourth on floor. In the 10 Seniors, Megan Mitchell took first on floor with 9.65, placed second AA and third on vault, bars and beam where she tied with Annie Bingle. Bingle was the vault champ and placed fifth on bars, fourth on floor and third AA. Treasa Brown earned her meet high score on floor. Competing in 11 Juniors, Emma Neaderland placed sixth on vault, third on bars and fourth on floor. Alison Enters earned fourth on both vault and beam while Maggie Russell earned her meet high score on beam. Lucy Collins won the floor and bars titles with 9.7 and 9.2, placed second on beam and fourth AA in 11 Seniors. Tetyana Banaryk was third on vault and beam and seventh on floor and AA in the 12s group. Reggie Frias earned second on floor and fourth on bars and AA in the 13 plus group while Nika Sibley was third on vault and beam and fourth on floor. Wall was the champion Level 5 team's leader, scoring a perfect 10 to win floor and AA for the 9-10 group with 38.10 and placing fourth on vault and second on bars and beam. Tori Ware won vault and beam with 9.5 and 9.85, placed third on floor and second AA. Kate Wolters scooped up the bars title and placed third on vault, beam and AA. Paige Domenici eared her meet high score on floor. Holly McGoldrick led the 11s, scoring 9.8 to win on both beam and floor on the way to taking the AA with 38.05 and placing second on vault and third on bars. Skye Greene and Dillan Aysseh tied for vault champ with 9.5, while Greene also placed fourth on bars and second on beam, floor and AA. Aysseh was also fifth on bars and sixth AA. Megan Cutler took first on bars, fourth on vault, fifth on floor and third on beam and AA. Lizzie Canelli was fifth on vault, seventh on floor and eighth on bars, beam and AA. In the 12-13 group, Sofia Pye took second on beam and AA, third on vault and floor and fifth on bars. Kerry McDermott was fifth on vault, sixth on bars, beam and floor and seventh AA. Alexa Carrero won the vault and bars titles with 9.55 and 9.5 and placed fifth on floor. In the 14 plus group, Sofia Fea was second on vault and bars and third on beam and AA. Lindsey Wallach was third on vault and second on floor. The Level 6 team was led by Lana Schmidt in the 12s group, who placed second on bars and vault, then scored 9.5s to win both beam and floor on the way to first AA with 37.70. Tess Keating placed second on beam and fourth AA. In the 15 plus group, Sarah Petti was second on vault, beam and AA and third on bars while Emily Medwid took second on beam. The Level 7s were also team champions, led by Juliana Jordao in the 11-13 group, who was the champ on bars, beam and AA with 37.00 and placed third on vault and floor. Allie Trotman took second on vault, bars, beam and AA. Gianna Cardini took the vault title with 9.6 and placed third on bars, beam and AA. In the 14-15 group, Kaitlyn Moussignac won the vault title with 9.6 and placed third on beam. Fiona Brock won the beam and AA titles with 37.55, placed second on vault and bars and third on floor in the 16 plus group. At Level 8, Jessica Freiheit won the vault, bars and beam titles on the way to first AA with 36.75. Kajsa Lundeen was second on vault, bars, floor and AA and third on beam. The team will now prepare for the North East Regional Championships to be held in Amherst, Massachusetts in May.